One of the best things about Autumn is most definitely pumpkin spice! I will admit to being a pumpkin spice junky... it should be a thing year round! This cozy sweater and jeans are new by Prism, and still available at the Scala Event, however the event is over, the sim is still there. If you don't make it in time though, it will be at the main store soon! The sweater is available in 10 colors or as a fatpack, and you can even mix colors like I did with mauve and brown, or wear solid color. The jeans are also available in 10 colors or as a fatpack, and both the sweater and jeans are made to fit Belleza Freya, Isis & Venus, Maitreya Lara and Slink Hourglass & Physique mesh bodies. 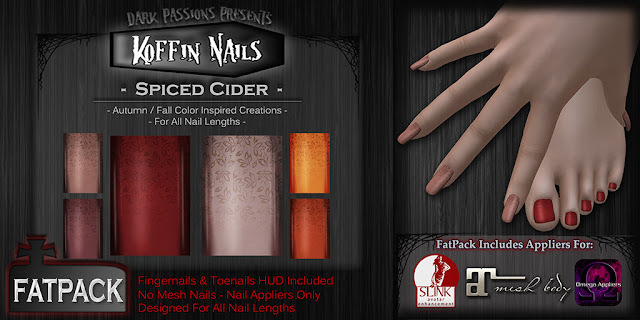 These gorgeous new nails by Dark Passions - Koffin Nails are available for a few more days at a special price for the Saturday Sale, then they will go up to full price. These nails include appliers for Maitreya, Omega and Slink hands and feet, with 6 gorgeous Autumn colors to choose from.